Veloutier Blanc Beachfront Villa is a vacation residence specially designed for its beachfront location. The large thatched roof and the touches of wood throughout give the villa a rustic appeal – heightening the faraway magic of the place. Its predominantly white color scheme not only complements the beach and beautifully contrasts with the lagoon of Pointe d’Esny but also creates an atmosphere that’s truly relaxing. Situated around this breathtaking seascape, Veloutier Blanc Beachfront Villa is, most certainly, in its rightful element. 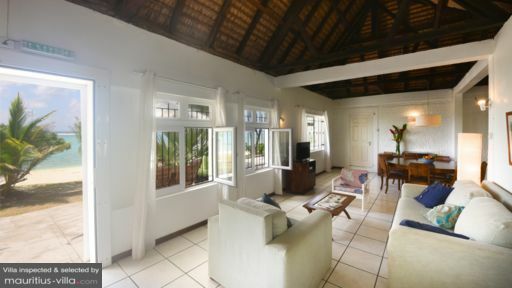 The villa has three bedrooms, though only the master bedroom has a view of the ocean. All bedrooms have ensuite bathrooms. The villa is built on the edge of an expansive and verdant lawn which slopes down to merge with the stretch of white sand. Run or wade into the turquoise waters of the lagoon to playfully splash around or to quietly commune with the ocean. On the open terrace of the villa, you can bathe in the sun as you recline on folding wooden chairs. 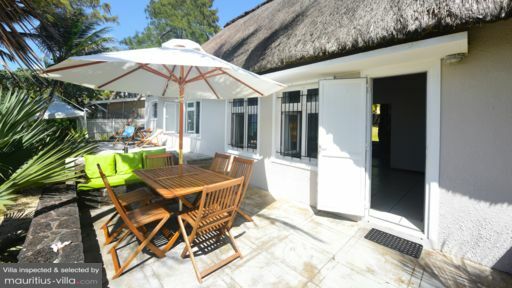 Or, you can sit by the wooden table under the shade of a large umbrella – sipping a cool, refreshing drink as you stare out to sea. Right from the villa’s seaside entrance is the living area. Here, on the large couch and chairs, you can all hang out to share your day’s adventures. Just a few steps away is the dining area. Around the wooden table good for eight you can all sit for a taste of the local cuisine masterfully concocted by the resident cook at the fully-equipped, modern kitchen set up in a separate room. Out on the villa’s covered terrace is a long dining table where meals, cocktails and after-dinner drinks may also be served. A property manager heads the villa’s staff composed of two housekeepers and a cook. Upon your request, a laundry helper may be called in. The services of the cook and the laundry helper, however, will be charged separately. Also available are bike and car rentals, excursions and shuttle services. 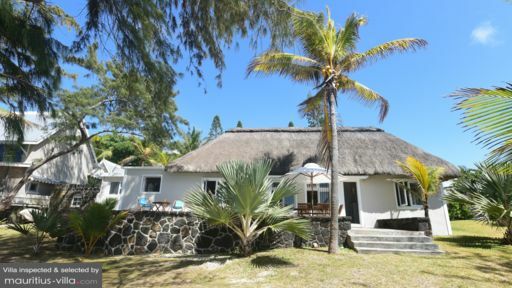 Veloutier Blanc Beachfront Villa is located at the southeastern part of Mauritius – along Pointe d’Esny, one of island’s best beaches. Right at the doorstep of your villa, you can have your fill of water sports such as windsurfing, kitesurfing, stand-up paddling and canoeing. On a separate occasion, you can also go fishing, snorkeling or even diving. One must-see attraction is the Blue Bay Marine Park which you can reach, on foot, in just 15 minutes. You can also hop on a boat and cruise to the Ile Aux Aigrettes Nature Reserve.